Today members of the Marist community will come together in an effort to promote sustainability initiatives on campus for the 5th Annual Sustainability Day. The theme of this year’s event is “Stewardship of the Commons” which centers on our duty to responsibly manage our shared environment. If you are a rookie “go-greener” and would like to expand your knowledge in the area of sustainable living, Sustainability Day is the perfect way to immerse yourself in an array of information about how to do so. Whether it is exploring the steps to leading a greener life as a college student, discovering local food options or learning about the environmental issues involving the Hudson River we live on, Sustainability Day promises to provide a wealth of informative resources. If attending Sustainability Day sparks an interest in improving your environmental friendliness, there are several steps you can take as a Marist student including joining SEED (Students Encouraging Environmental Dedication), making wiser choices in the dining hall by opting for locally-grown, organic meals, and enrolling in an environmental science class to learn more about the earth we inhabit. Additionally, you can take this quiz (http://bit.ly/DGG1v) to discover your ‘carbon footprint’ and then examine which areas of your life can be improved to use resources more efficiently. My path toward leading a greener life began as a Marist student. I developed an interest in sustainable living while taking an online environmental science class through Marist. The course opened my eyes to the detriments imposed upon the environment each day by our society. As a result, I implemented small changes in my daily life including conserving energy in my Fulton house as well as using re-usable water bottles, coffee mugs and grocery bags. I amped up the efforts during my senior year when my capping group created a campaign to promote eating locally-grown foods. The semester-long campaign included the first ever campus farmers market which continues to take place throughout the fall season at Marist. After I began working in the admission office, I was offered the opportunity to serve on the Campus Sustainability Advisory Committee (CSAC) which allows me to stay involved in continuous environmental efforts within the campus community. As a former Marist student and current employee, I have a vested interest in leading an environmentally-friendly lifestyle on our beautiful campus. 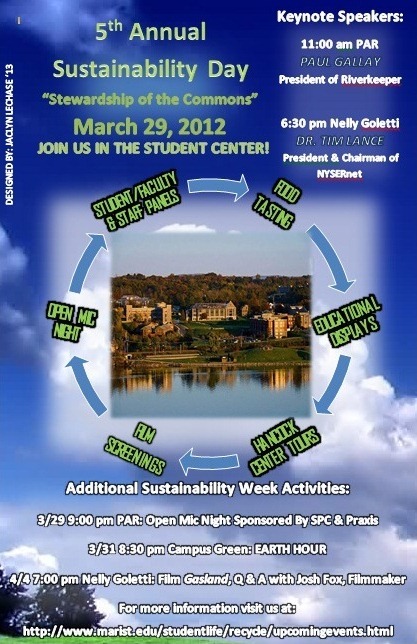 Regardless of your environmental prowess, I encourage you to attend the Sustainability Day events this Thursday, March 29th in the Student Center. The more we learn and the more we do for our planet each day can only help in creating a more sustainable future. Go Green! ← Goldman Sachs Wants ME? !